Colonel Tom Carpenter, during his fifth space mission, was being kept awake by the blabbering of the Cape Canaveral Control Centre operator, who offered him the following puzzle. "Here's a deck of 52 cards, Tom. I'm taking the Aces and the Royals out of the deck. Do you copy that, Tom?" "Roger," the yawning voice of the astronaut answered. (c) the sum of the even ranks and the sum of the odd ranks produce two numbers: the difference between these two numbers is 9, but I won't specify whether it's the sum of odds being greater than the sum of evens, or viceversa. 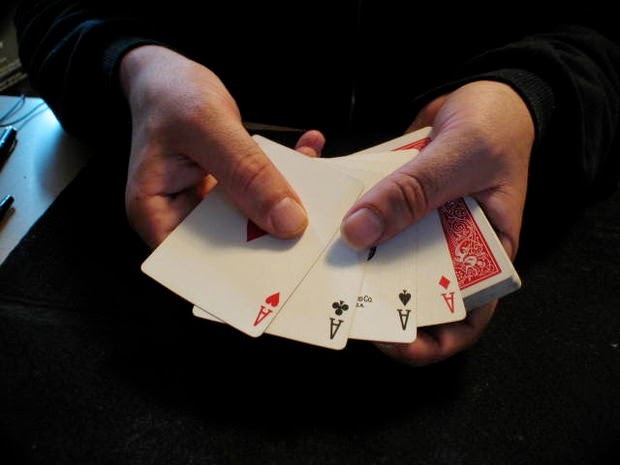 (d) the sum of ranks of the red cards is exactly twice the sum of ranks of the black cards. After a pause, Tom managed a faint "Roger." (g) there are no 2 cards with the same rank. Which cards did I draw? Tom, are you listening? Which cards have I got?" Deduce which five cards he necessarily holds. During the next orbit, the sleepy but correct answer came forth from the astronaut: 2 of clubs, 5 of hearts, 7 of diamonds, 9 of spades, and 10 of hearts. But (d) states that the sum of red cards is twice of the sum of black cards, so the first 2 combinations must be excluded, because it's not possible to find 2 sets of numbers, one of which is twice the other; therefore the 5 ranks can only be 2, 5, 7, 9, 10. The red cards must be 5, 7, 10. Following (e), rank 2 must be clubs and 10 must be hearts, so rank 9 must be spades; following (f), rank 7 has got to be diamonds and rank 5 must be hearts.